I have completed the third novel in the Malcolm Craig series and have published the book as a paperback and as an Epub E-book. 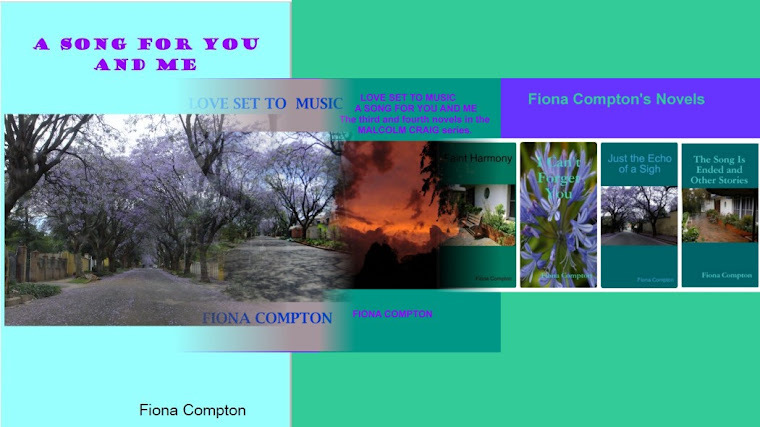 Read more at: Fiona's Store - fiction with a musical theme. Fiona Compton has pointed out that the novels in the Malcolm Craig series are partly novels with a key and partly biographical/autobiographical novels. She has written these books under a pen name, presumably because she did not want to write the story as rather sensational fact, but preferred to write it as a mixture of fact interspersed with fiction. Possibly she wrote the Malcolm Craig series in this way so that she would not hurt or embarrass family and friends of the protagonists. I found Love Set to Music most interesting. I imagine that the character of Kate Kyle is Fiona Compton herself, thinly disguised. Neither Kate Kyle nor Malcolm Craig are covered in glory and some might consider their spring/winter relationship unseemly even over fifty years later. They obviously felt deeply for one another and Malcolm Craig's wife, Marina Dunbar, was not without blame. I look forward to reading the final book in the series and sincerely hope that it will reach a satisfactory conclusion otherwise the emotion generated by the affair which changed the life of Kate Kyle/Fiona Compton radically without bringing her lasting happiness would have been a meaningless waste of time. After I finished my secretarial course I was working in the cables department of a city bank in Simmonds Street. 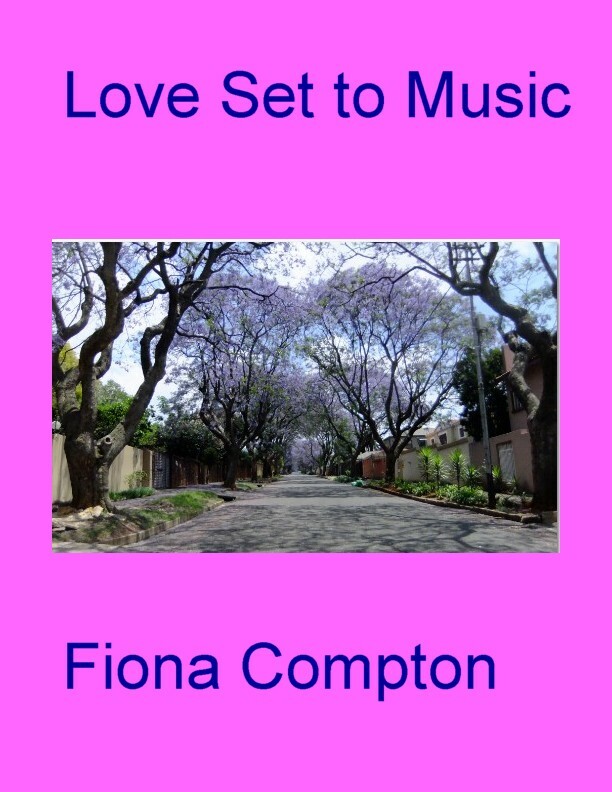 I was taking lessons in piano and singing and preparing for various exams so I had to get up at the crack of dawn to practise my scales in singing and piano before I went to work. I was exhausted by the end of the day! Liz was on her April school holiday but I was working a five and a half day week in the bank with no sign of any holiday in view. My father had promised that if I did well in the exams he might allow me to leave the bank and study singing and piano full time until I completed my diplomas in both subjects so I was determined to do well no matter how exhausted I was. Becoming a professional musician was far more appealing to me than spending the rest of my life typing out letters and cables in the bank, and working overtime when the Rhodesian Sweep cables arrived and had to be decoded so that the bank could notify all the lucky winners that they had won a lot of money in the sweep. One day Liz phoned during my lunch hour. She was very excited. “Malcolm needs a small studio audience for his Edwardian programme tomorrow night and he’s just phoned to ask if I’d like to go. I suppose he’s been in touch with you too, Kate?” she asked. My heart sank for he hadn’t asked me. I felt a stab of pure jealousy that my friend had been asked to go to the recording and Malcolm hadn’t bothered to ask me. Liz was silent for a moment. She had probably assumed that Malcolm would invite me and she must have known that I was feeling very hurt not to have been invited. “Well, it’s still not too late. Maybe he’ll phone you once you get home,” she said brightly, and then found an excuse to ring off quickly rather than commiserate with me any further. I continued eating the sandwiches my mother had made for my lunch, although I could hardly swallow them because there was a persistent lump in my throat. I did my best to keep a brave face and not let the tears that were welling up in my eyes run down my cheeks. Marina and I were having a snack lunch in the studio. Eunice always managed to think of something interesting to put in our lunch boxes. As far as I was concerned the lunch break was the best part of our day in the studio. I really was not cut out to teach other people how to sing. I had managed to get out of most of the morning’s lessons by spending time in the office telephoning friends to invite them to the recording the following evening. I hadn’t even thought about whether Kate would be disappointed, but I realised that Marina was quite right. Kate would be very hurt indeed if I didn’t invite her to the recording. Despite her reserve, I didn’t need Marina to tell me that she thought a lot of me. She was probably as fond of me as I was of her. Why on earth hadn’t she been the first person I phoned instead of leaving her out altogether? I looked up her number in the studio diary and made the call. I don’t think I have ever heard anyone happier to hear my voice in years. I hoped she didn’t have a boyfriend, but if she did, I’d have to put a good face on it and receive the spotty youth with good grace. “No - we’ll be sure to be there on time,” Kate assured me solemnly. We were usually pretty casually dressed when we went to rehearsals for the choir. Sometimes Liz was still wearing her blue school uniform if she hadn’t had time to change after some activity at school in the afternoon. We had never seen any of the other broadcasters formally dressed when they arrived at Broadcast House to record their programmes or read the news, although we had heard that BBC news readers had worn evening dress to read the news in the nineteen-thirties – and possibly beyond. I was glad that Liz and I had dressed smartly for this particular trip to Broadcast House. When we arrived in the brightly lit foyer, there was Malcolm Craig clad in evening dress with a flower in his lapel, while Marina Dunbar wore a low-cut red evening dress, with a mink stole around her shoulders. Their great friend, widower Steve Baxter, a well-known broadcaster on Springbok radio, was obviously going to attend the recording too for he was also formally clad for the occasion although his usual attire for his own broadcasts was a sports jacket and open-necked shirt. Although she was not taking part in the broadcast Marina was playing hostess to the people Malcolm had assembled for the recording. She ushered us all into the small studio where the recording was to take place and urged everyone to take their seats. “Keep a seat for me in the front row, won’t you darlings,” she said to Liz and me. Our parents sat together further back while Liz and I took our seats in the front row on either side of the coveted seat we were saving for Marina, or Miss Dunbar as I still called her. We were beside ourselves with excitement. Malcolm seated himself at a small table to the right of us, ready to begin the recording when he received the nod from the controllers who were seated in the enclosed glass booth at the back of the studio. He took a sip from the glass in front of him and glanced around at the audience. There was no further repartee between them after that exchange. Malcolm told us to clap politely after the items and talk in undertones to each other to create the atmosphere of a refined Edwardian drawing room. Although most of the audience applauded after the violinist and soprano had finished performing, it was only Marina who chatted to us brightly about the performers, and Liz and I did our best to respond with the necessary degree of ladylike decorum. For some reason everyone else seemed overwhelmed by the occasion and uttered not a word. Malcolm got up from his chair in the corner and walked over to a spot directly in front of us to sing two ballads. Of course I had heard some of his recordings on the radio and I had heard his voice in the studio when he was showing me or one of the other pupils how to sing something properly. I had even heard him singing the Messiah when I was 13, but to experience him singing right in front of me was something I would never forget. Oh, Dry Those Tears and Parted – both sad Edwardian ballads, which he sang in his beautiful voice with all the feeling he could muster. I was completely mesmerised! I almost forgot that I had to chat politely with Marina and Liz after he stopped singing. At the end of the recording everyone surged around him, congratulating him on his performance. Liz and I were the last in a long line of his admirers. “All right? You were brilliant, Malcolm!” said Liz with all the confidence of youth. We nodded eagerly. I certainly couldn’t wait for the next time! As we left the studio, I caught sight of Marina chatting to Steve Baxter while Malcolm was having a serious discussion with the accompanist. I thought I should say goodbye to her before we left, but I had the impression that she was not pleased that I had interrupted her intimate conversation with Steve Baxter. “Yes, darling. We’re both very proud of him, aren’t we?” she replied in mocking tones, patting me on my arm. My face grew hot with embarrassment. and I suddenly felt deflated and childish. I realised then that I would be well advised not to offer such fulsome praise in future! Marina and Steve must have thought me very young and gauche. After that magical evening it was difficult to settle down to sleep and it was a particularly dull thud that I had to force myself awake early in the morning to be in time to catch my regular bus with the other workers on their way to spend all day in shops and offices in the city. “I’ve probably failed,” I replied with conviction. He gave a little chuckle and marched back into the studio, leaving me to wait in the kitchen till Sonette finished her lesson. He called me in excitedly and handed me my card. I had obtained honours for Grade 8. I always expected the worst so I was always surprised if I did well. When I heard that Sonette with her brilliant voice had only managed 72 per cent for Grade 5, a mere pass, I felt disproportionately pleased, while congratulating her. Liz had passed Grade 6 with 72 per cent also. Marina and Malcolm seemed delighted with my results, and for most of that lesson, we drank tea and made firm plans for my diploma. Marina was wearing a black derby style hat and looked particularly striking in it. We all got on so well together that day. I got honours for the piano exam too. My father was suitably impressed and agreed that I could stop working in the bank soon and study music on a full time basis. A theatrical garden party was organised for early October at the old Rand Show Grounds at Milner Park near the University of the Witwatersrand. Marina asked whether Liz, Sonette, and I would like to help out at it. Naturally, we all jumped at the chance although we weren’t quite sure what we were meant to do once we got there. I wore a new dress for the occasion with a large white hat, decorated with a rose. Even I, who always disparaged my own looks, thought I looked quite glamorous and actressy. Liz had recently passed her driving licence and was enjoying having the freedom to drive her mother’s tiny Fiat to school each day. Liz, who was also looking very glamorous for the occasion, fetched me in this little car which was bubble-shaped and opened from the front. We had a rather precarious drive, precariously near to the tarmac, to the show grounds. Since Marina’s recent affair with Steve we were more estranged from one another than ever before although she had decided that staying married to me was the lesser of two evils. Marina was certainly taking her time getting ready for the garden party. We had promised to meet the girls at 3 o’clock and it was nearly that time already.Her bedroom door was firmly closed and as I really hate being late for appointments I knocked tentatively. “Am I so repulsive to you that you can’t even come into my bedroom any more without knocking as though we are complete strangers?” she replied in a strained voice. I opened the door. She was wearing nothing but flimsy underwear showing off her still perfect figure which had given me so much pleasure in years gone by. Her face was red and blotchy from crying. “What nonsense. Kate and I get on very well together and she has the making of an excellent accompanist. There’s nothing more to our relationship than that. I’m very fond of her and I certainly wouldn’t be able to manage without her now,” I lied. As I waited impatiently for Marina to get ready, it occurred to me that I was indeed terribly fond of Kate although it had never crossed my mind to make love to her. She was just an innocent teenager and didn’t even have a boyfriend. But now Marina had made that suggestion I began thinking about her. Although she was reserved and had never put herself forward to me as so many other girls and women had done before her, I was well aware that she thought the world of me. As I idled away the time waiting for Marina, I began to imagine what it might be like to make love to Kate, to lie between her full firm breasts and be the first man to kiss her on her beautiful mouth and awaken her from innocence to sexual delight. Marina emerged from her bedroom fifteen minutes later, beautifully groomed as usual, but a little pale and very subdued. I still couldn’t figure out what had brought on her extremely bad mood and her wild accusations. Perhaps she was missing Steve, particularly now that he was engaged to Helen and would be married in a few weeks time. Steve had probably told Helen all about his affair with Marina, so she would make sure that Marina did not get her hands on him again. By the time we got into the car we were both in a bad mood and we were still squabbling and bickering as we walked down the path to where we had agreed to meet the girls. It seemed I couldn’t do a thing right that particular afternoon! But when I saw how lovely Kate looked on that sunny day, my mood lifted at once and I was overwhelmed by her beauty. Liz and Sonette, pretty though they were, paled into insignificance in comparison. I forgot about Marina and her complaints as I put my arm around Kate’s waist, and said, “You three girls looks quite gorgeous.” At last I knew that it was Kate who was really special to me. I wished I could carry her off and make love to her right away and I wondered what had taken me so long to realise what I really felt for her. It was all too much for Marina. She stormed off by herself and I had no choice but to follow after her reluctantly leaving the girls behind watching us as we disappeared into the bosom of the other celebrities who were about to have a strawberry and cream tea together. It certainly would not have done if the sweethearts of song were seen to be at odds with one another among all our theatrical friends!